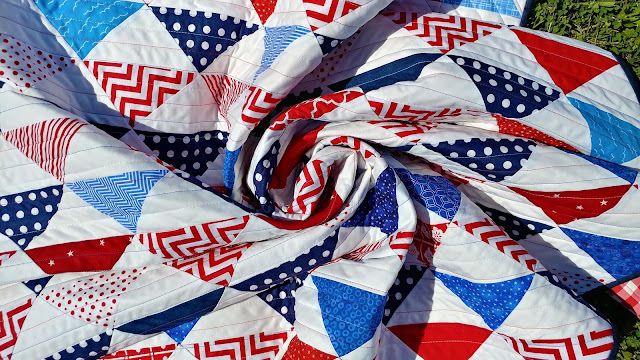 Last year, I made two red, white, and blue heart quilts (see them here and here). When making them, the pattern made lots of bonus half-square triangles (some call this "goose poop!"). I have plenty of things on my need-to-do list (many with impending deadlines! ), but Memorial weekend seemed like the right time to get out the HSTs and sew them up. I started by counting to see what I would be working with. After pressing, I used my 4 1/2" Bloc-Loc ruler to trim them. There were a few that were just shy of the right size, so I tossed those out. Once again, my handy dandy table cloth design wall allowed me to lay out the design and make adjustments to what I thought looked good. 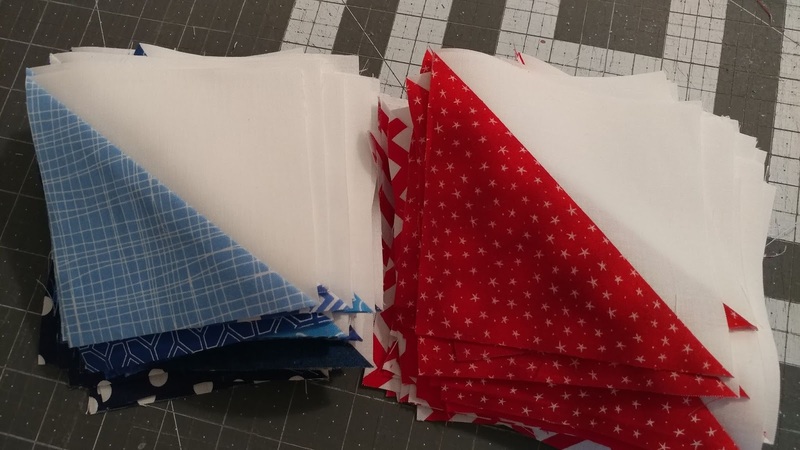 Half of the blue HSTs were all the same navy and white polka dot fabric, and half of the red HSTs were all a chevron print. I tried a couple different layout options before deciding on this one. I used my numbered pins (one of my most used notions!) 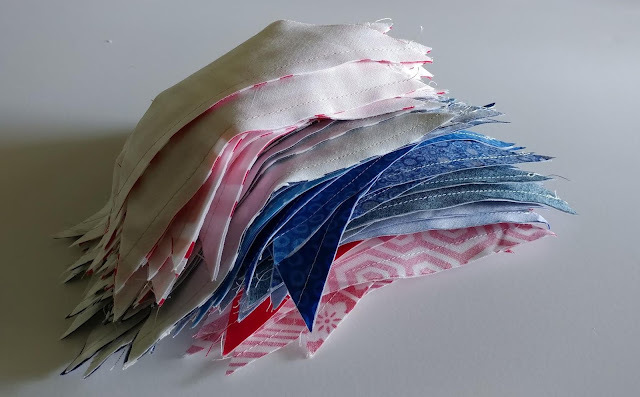 to keep track of each row as I sewed the HSTs together. 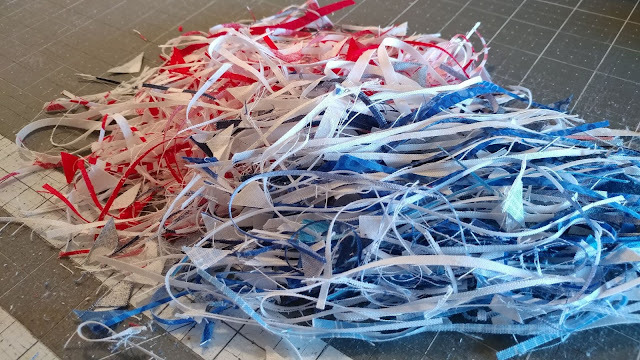 I did consider leaving the top sewn and putting it away to finish around the 4th of July, but decided while it was out, I should just finish it so it wasn't a UFO any longer! I cut the backing and batting to size, then pin basted the quilt on my dining room table. 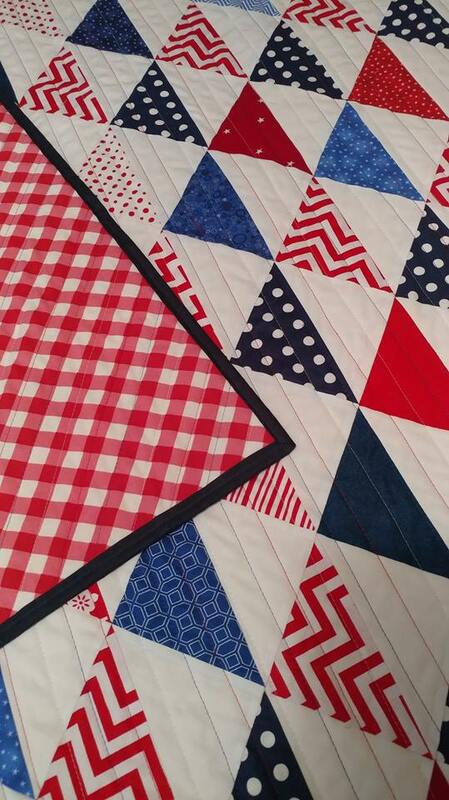 Aurifil 50wt thread in Red #2250, White #2024, and Medium Blue #2735 were perfect for this quilt! 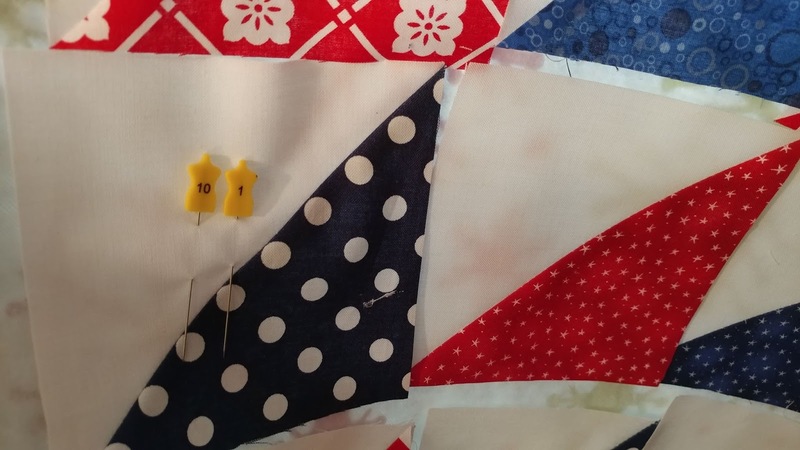 I used my walking foot with guide to quilt straight lines on the diagonal. I wanted the lines to be 3/4" apart, but only did one color at a time. I first did all the red lines. Last, I stitched the white lines. I always love the texture that quilting adds! I cut 2 1/4" binding from the scraps of Art Gallery Nocturnal I had left over from this quilt. Of course I machine stitched it on. 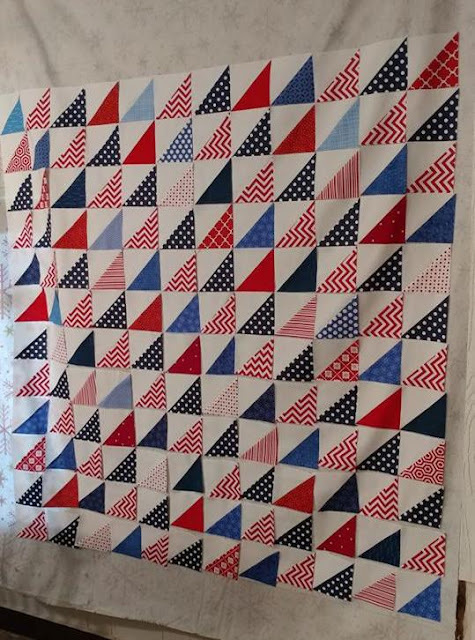 I finished the quilt just before bedtime on Memorial Day! 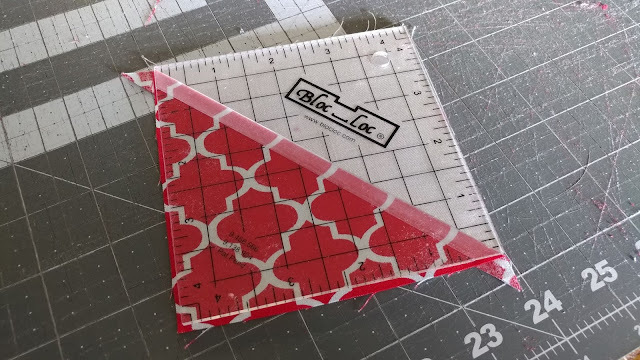 I really love the red gingham backing fabric I bought from Connecting Threads! I thought I had ordered yards and yards of it, but discovered that was just in my imagination. This used up most of what I have! 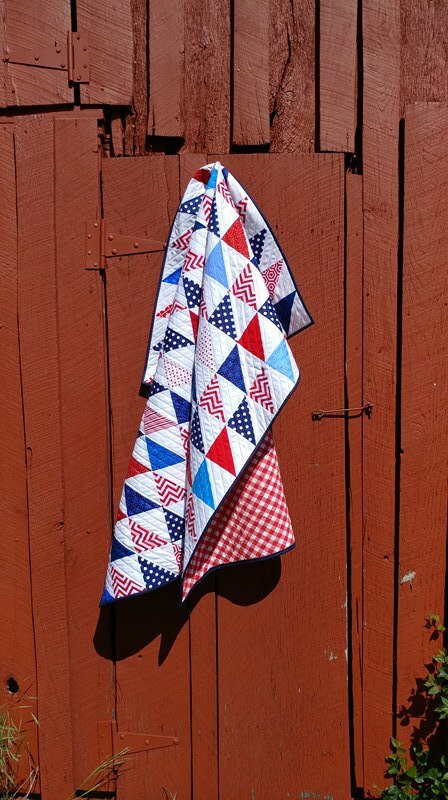 It's such a great backing for summer quilts! I'm excited to have this "bonus" quilt for the kids to use this summer! I can already see us sitting on it at t-ball games and for the 4th of July fireworks show. The quilt is just 48" square. A great size for keeping in the car for summer. Linking up with Linky Tuesday at Freemotion by the River, Let's Bee Social at Sew Fresh Quilts, Wednesday Wait Loss at The Inquiring Quilter, Midweek Makers at Quilt Fabrication, Needle and Thread Thursday at My Quilt Infatuation, Finished or Not Friday at Busy Hands Quilts, Can I Get a Whoop Whoop at Confessions of a Fabric Addict, TGIFF at Devoted Quilter, Friday Foto Fun at Powered by Quilting, and Finish It Up Friday at Crazy Mom Quilts. This quilt is so perfect! I love how simple and beautiful it is. 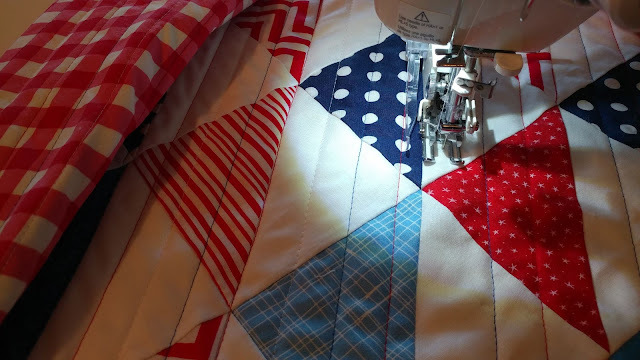 I really like the diagonal quilting lines, and that you used all three colors of thread for them. That's a fantastic touch. 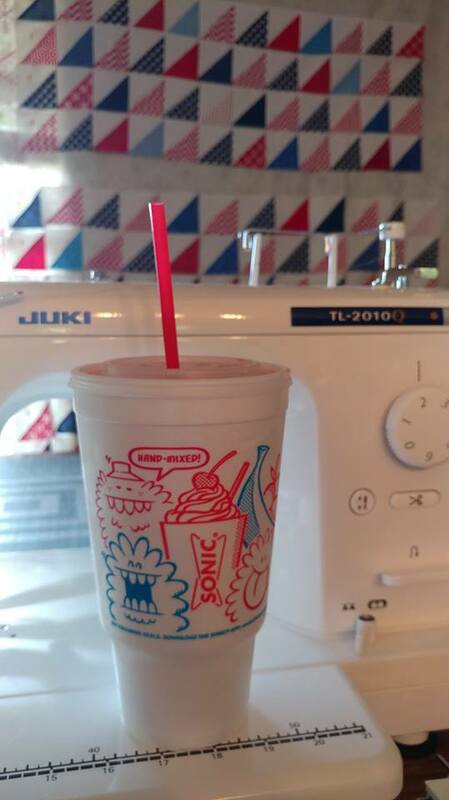 I'm also a little jealous that you have Sonic where you live! My hubby and I are planning a trip to Colorado later this summer. We always make sure to hit up Sonic and Panera while we're there. Thank you, Bobbi! Sonic is fantastic! I am head over heels for their frozen strawberry lemonade! Mmmmmmm!!! Beautiful!! Everything is perfect from the fact that it's a bonus quilt to the colors to the quilting. Now I'm curious. How many spools of Aurifil do you have? 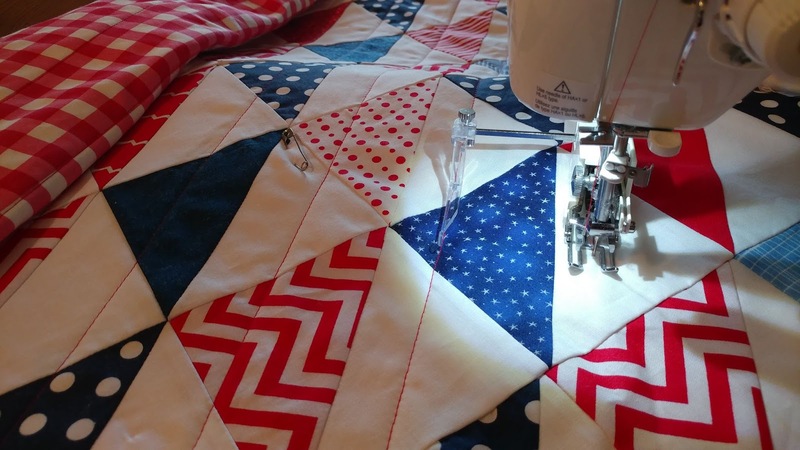 That is one cute patriotic quilt! Great photo on the barn. Thank you, Nancy! I love being able to use our barn for photo shoots! Thank you! I did make a comment and clicked the notify me box, but there's no way for me to access any of the email addresses. Blogger did finally say today that they are working on it, so I'm hopeful the feature will be restored soon! This is so cute! I love the three different thread colors and the way you did it was so smart so you could do one color at a time and not change thread colors repeatedly! Thank you! Changing threads and/or bobbins is why I like to just stick with one color for piecing and quilting! It makes it so much easier! But I'm trying to be better about adding color. I've come a long way from only using white for everything though! 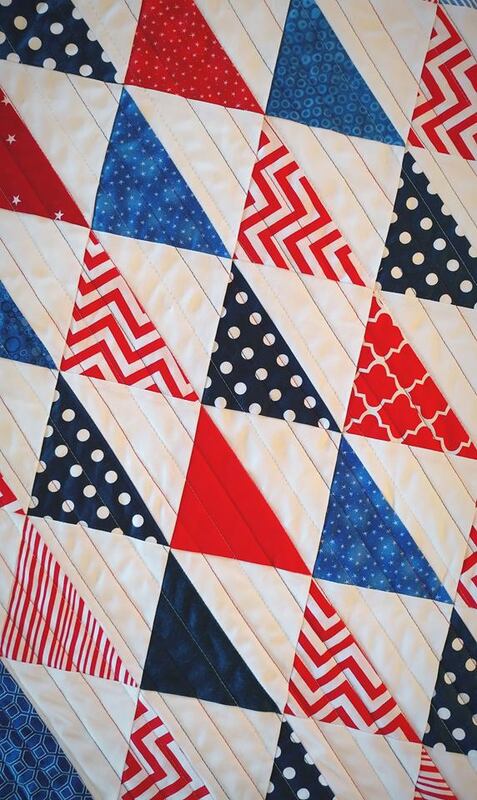 This is such a beautiful quilt - a great way to use those bonus triangles. I haven't heard it being called goose poop, but what a funny and appropriate name! Your goose poop quilt is gorgeous! Thank you, Shasta! Best kind of poop I know! What a gorgeous quilt. Ild be afraid to use it outdoors but you’re right, it’s the perfect summer quilt. I do have lots of quilts that are not allowed outdoors, but I love having quilts that we can throw in the car and use for anything. I made this one from "leftovers," so it won't pain me if it gets grass stained. Just making memories with my kids! It is so nice when you get a chance to make a quilt from elements that are already completed. I love 1/2 square triangles (never heard them called goose poop before) and have a BIG box of triangles I've saved. Should get them out to play with! You should get your triangles out to play! These are just called "goose poop" because they were made from the cut-offs from making stitch-and-flip corners. The name comes from the excess fabric cut off when making flying geese. I'm trying to finish up some UFOs - so this was a good stack to change into a usable quilt! I love your quilting! 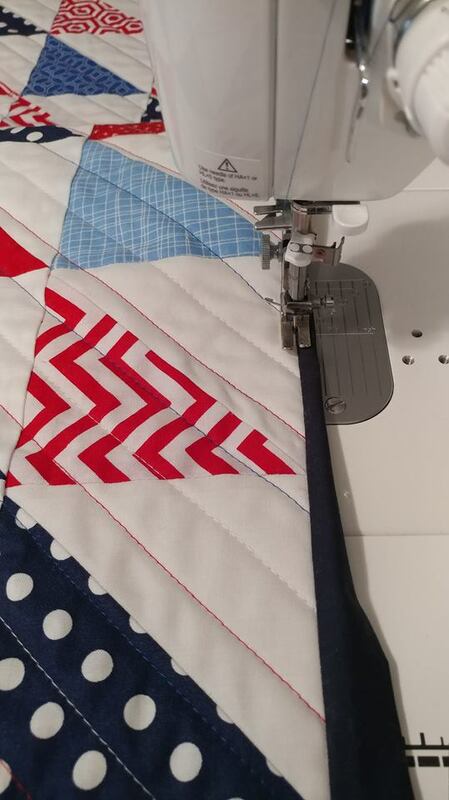 I am trying to embrace my own machine quilting and getting things verses having them sit unfinished for fear that they will not be perfect since I can't afford to have everything machine quilted. I love how you used the different colored threads--great idea. It is such a bummer about blogger not emailing us anymore--total pain in the neck. Finished is better than perfect! I'm usually too impatient (and cheap!) to send my quilts out to be quilted. I like using my walking foot, but I have a few go-to free motion designs that I can do without too many errors. Once washed and all crinkly, it's quite hard to notice the imperfections anyway. Thanks, Roseanne! You hit the nail on the head - "so they can't call out to you any longer!" Yes! That's exactly how I feel! I have a couple more UFOs that keep calling out - so they're up next on the chopping block! Love the Quilt the backing is perfect. Thank you! I need to stock up on more of the backing fabric before it's too late! My favorite - RWB!! Lovely fabrics to make this a super crisp quilt - well done! Thank you, Susan! I'm excited to have one that isn't "too good" to be used! Sometimes those quick and easy projects are just what the doctor ordered! It looks great! 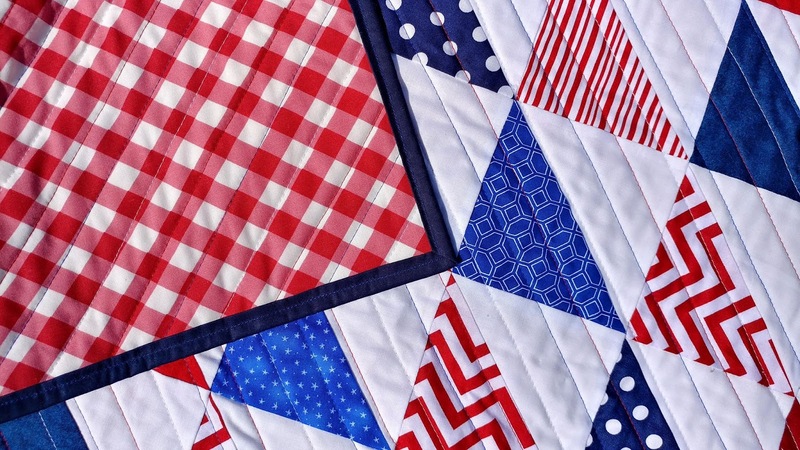 I love that you used alternating lines of red, white, and blue in the quilting! Thank you, Emily! I'm trying so hard to use more color in my quilting! My first instinct was to just use white, but then I decided to be more adventurous and add in the other colors. It adds just enough color to make it a bit more interesting! Lovely quilt! Thanks for sharing it on Wednesday Wait Loss. And I'm a bit jealous as well. I love Sonic but they aren't near us. 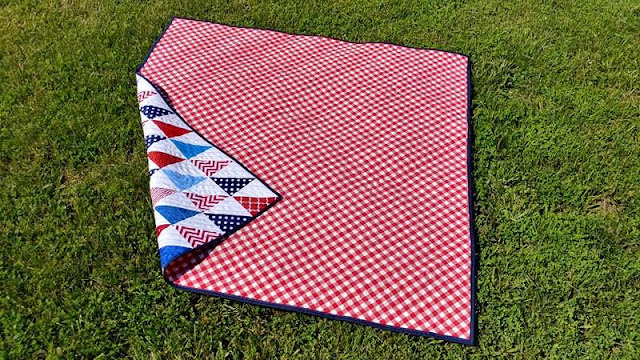 Such a lovely quilt for Summer picnics to keep in the car! Have a great Summer! It's such a beautiful, summery quilt! This whole blogger comment notification thing is such a pain! I wish we had some indication on whether or not they're even working on fixing the problem. This is a beautiful quilt and the backing is perfect for it! Great job! So Laura -- I feel that DESTINY, and not just the Friday linky party, has brought me to your blog today because I was weighing my options for my next quilt, leaning toward something with HSTs, and I recently purchased a couple of those Bloc Lock rulers but haven't tried them out yet. 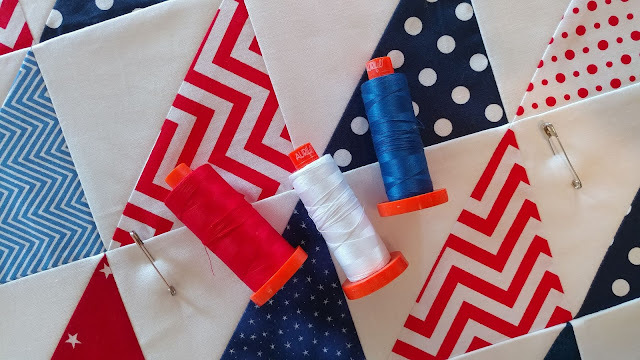 I really love your Memorial Day HST quilt, and you're right -- it's a great idea to make a patriotic schemed quilt for Summer holidays. Congratulations on your lovely finished quilt! 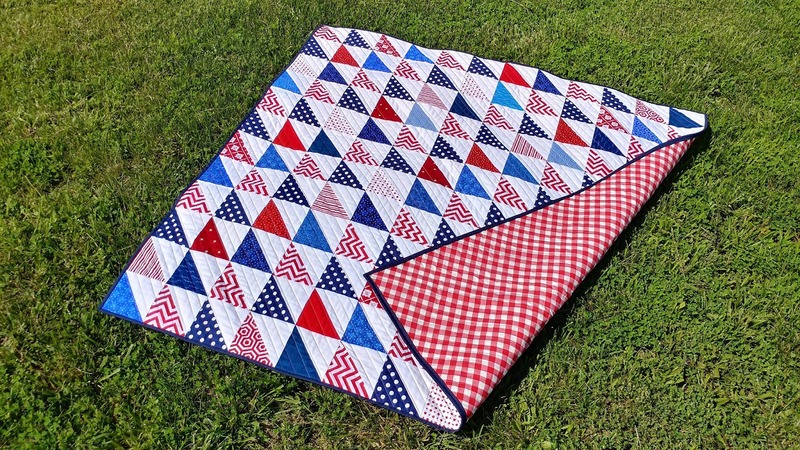 I am in love with this cute little R,W and B quilt! I was going to ask how you figured the math for doing all the red lines, then blue lines, then white lines and getting them 3/4" apart. Then I remembered! You're a math teacher. I can do it, just takes me longer!! "giggle"
Super cute quilt! 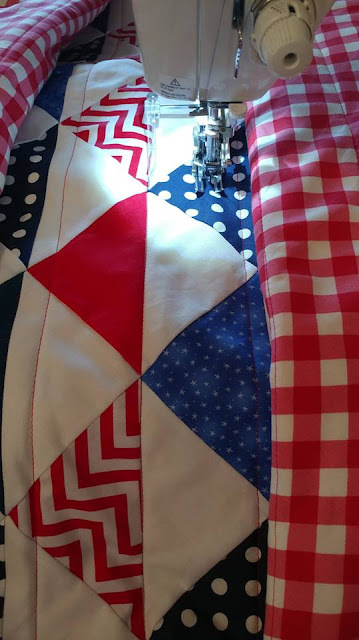 I love that you alternated the thread color too for the quilting! Looks great! 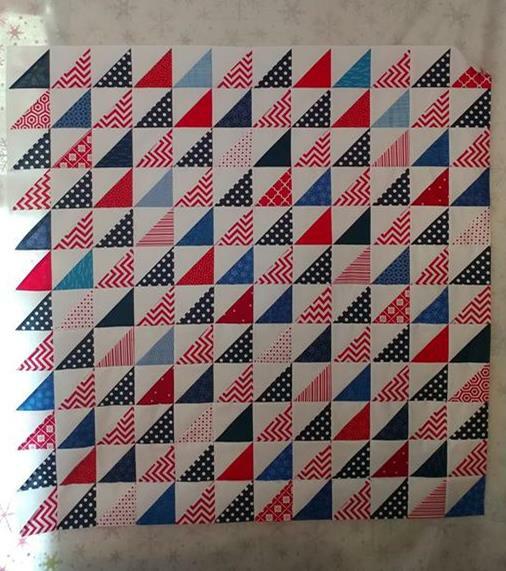 I just love your HST Memorial weekend quilt! It is just SEW CUTE!